In the midst of an angst-ridden world (the reasons for which I am not inclined to either debate or deconstruct ) I am filled with hope – genuine, deep, joyful, solid, reasonable, tangible, and vibrant hope. It has nothing to do with marching or winning, protesting or legislating, yelling or cajoling, or anything else that currently floods the media waves. It has to do with this only: that in the past three weeks I have been in the presence of 500 people who are changing the world. Their impact ripples past rhetoric, policies, statements, and signs. Their influence extends beyond sound bites, screen shots, strategic branding, and social media. Their identity is rooted deeper than gender, race, economic reality, and Enneagram number. They are men and women – some paid (but many not) who love Jesus, love adolescents and believe that life without the Saviour isn’t life as it was meant to be. They spend their days living out these truths, working creatively and tirelessly to collide their passion, calling, and faith in such a way that Jesus shines brightly while students are loved deeply. In the past three weeks, I spent time with 300 new staff from across the Young Life mission and 200 youth workers from 17 churches in the Madison area, which is to say: in the past three weeks, I spent time with 500 people who are changing the world because they are pouring into the lives of those who are often ignored, bemoaned, overlooked, demeaned, stereotyped, disregarded, brushed off, feared, sold short, sidestepped, and otherwise treated as less than someone created in the image of God. These 500 people love, care for, spend time with, are committed to, walk alongside, mentor, listen to, talk with, and pour into middle school and high school students – joyfully, enthusiastically, fully, sincerely, energetically, and prayerfully. While the world is focused on large-scale events; while people debate what should and shouldn’t be; while groups tackle policy and those who generate it; while movements stake a claim for their particular vision of right and wrong; while some embrace and others reject someone or something; while some cry foul and others cry fair; while the world spins crazily on its axis (as it has done since just about forever), I invite you to stop for just a moment and rejoice because FIVE HUNDRED PEOPLE (and so many, many more) who you will likely never see, meet, or know are quietly, confidently, boldly, and faithfully doing the work to which they’ve been called. And because they are, this world is being changed, one beloved adolescent at a time. Indeed, that is reason to rejoice. Over and over and over again. 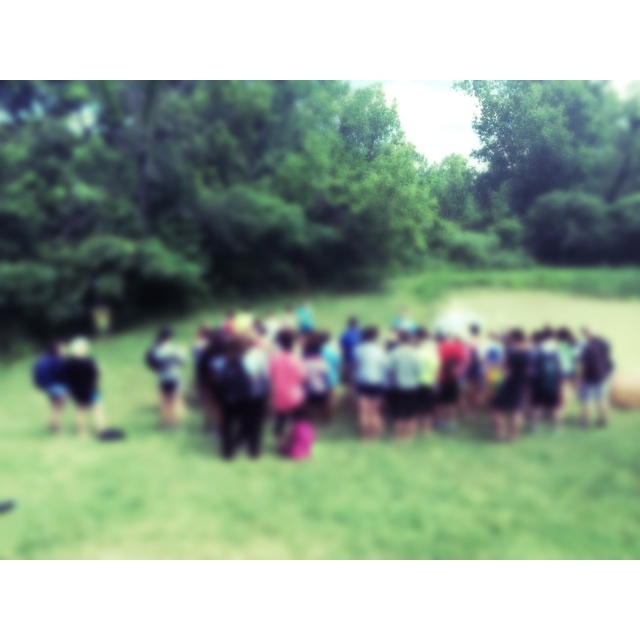 Young Lives Camp, Day Five. and like weeks have passed since we first met mamas and babies. Indeed, a week of Young Lives camp cannot be measured in real time. There are too many joys, too many tears, too much laughter, too much crying, too much playing, too much resting, and too much life to measure in days, hours, or minutes. A week of Young Lives contains a lifetime of love, hope, friendship, and in the end, family. The childcare workers (gracious, yes) do indeed fall in love with each and every baby, toddler, and child they care for – not as deeply in love as the mamas (gracious, no), but in love nonetheless. There are countless circles of love here at Young Lives camp: mamas for the babies, babies for the mamas, mentors for the mamas, work staff for the campers, childcare workers for the babies, childcare workers for each other. Each circle is a community of belonging and a family of hope. All of these circles matter deeply. It is not just the love for babies that carries the day here at Young Lives – though that love is glorious indeed. But it is primarily – solely and only, in fact – God’s love for fallen, broken, sorry, and undeserving humanity (each and every one of us) that carries the day. His love is why we care. His love is why we have hope. His love is why we wake each day. His love is why we are here. His love is why we live. His love is why we love. In less than 24 hours, several hundred middle school students and leaders will descend on a sacred place in the Ozarks for the very first week of summer camp at Young Life’s Clearwater Cove. Most of the world knows absolutely nothing about this. But a very small sliver of the world – and all of God himself – knows very well what is about to happen here: fun, love, Jesus, grace, hope, and real life. While much of society is bemoaning the current trends and behaviors of teenagers, twenty high school students have given up a month of their summer to willingly, enthusiastically, and joyfully serve middle school students at this sacred place nestled atop a mountain of rock. No joke. These people right here are people you should know. They are going to change the world – while they are still in HS – because they are serving the very God who made the world. In the midst of depressing headlines, deadly conflicts, and desperate situations, these twenty high schoolers (and 36 college students, and so many others) are choosing hope, life, love, joy, forgiveness, and transformation. God does that. He gets hold of a person’s heart, flips it upside down and inside out, remakes it into something alive, and sends it out into the wide world to be light and love, salt and sweet aromas, in order to draw others into his infinitely welcoming arms. I don’t know what you’re doing this summer. But these folks here, and countless others like them across the US and the world, are doing something big and bold and beautiful: they are being obedient, they are being humble, they are serving, they are giving, they are considering others as more important than themselves – and because of that, God is going to do mighty things. I have no doubt. Clearwater Cove, tucked away in a corner of God’s overwhelmingly breathtaking creation, is ready to fling wide open its doors and welcome teenagers to a week they will never forget. Gracious sakes – the work of celebration and the celebration of work have just begun, and for many people, life will never be the same again. Once there were four friends from the suburbs of Chicago who were fans of Lou Malnati’s pizza. For obvious reasons. Reasons like, oh, I don’t know, World’s Greatest Pizza of All Time. (They ship nationwide. Game changer.) On Friday nights, instead of going to the lights, they went to get Lou’s pizza. For obvious reasons. See above. They ate pizza for dinner. If their guts and souls weren’t full, they ate pizza for dessert. 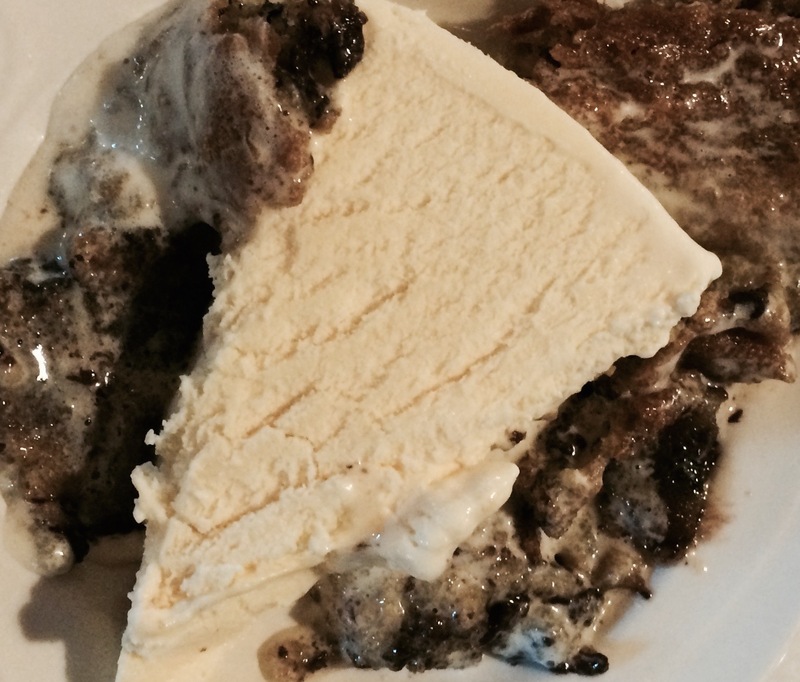 Chocolate Chip Pizza, that is, “a freshly baked chocolate chip cookie prepared in a deep dish pizza pan, topped with vanilla bean ice cream and whipped cream. Serves 2-3.” 1610 calories per serving. In case you’re wondering. Some years later, one of those four friends from the suburbs of Chicago – let’s call him Russell – found himself working in the kitchen at a lovely little place in northern Minnesota called Castaway Club (a Young Life camp) alongside the main chef – let’s call him Dave. 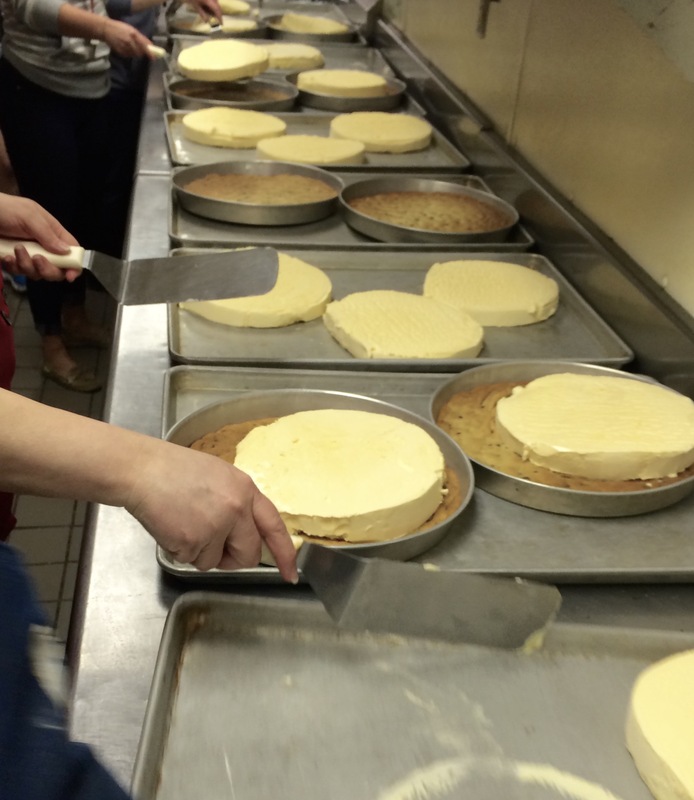 During the summer months, Castaway Club serves 3 meals a day to 400 people, give or take. One day Russell and some co-workers drove to The Medium-Sized City just down the road a ways to eat at a new “chicago” pizzeria – which every Chicagoan knows is a slippery claim to make and a nearly impossible standard to uphold unless the pizzeria is, you know, actually in Chicago. They went hoping for the best, but prepared for much less. He wasn’t talking about making The Real Thing for that small group of friends. He was talking about making The Real Thing at camp. For 400 people, give or take. Thus began a long process of experimenting with ingredients, temperatures, timing, pans, ice-cream, serving, and all sorts of baking-in-a-big-kitchen-for-several-hundred-people issues. 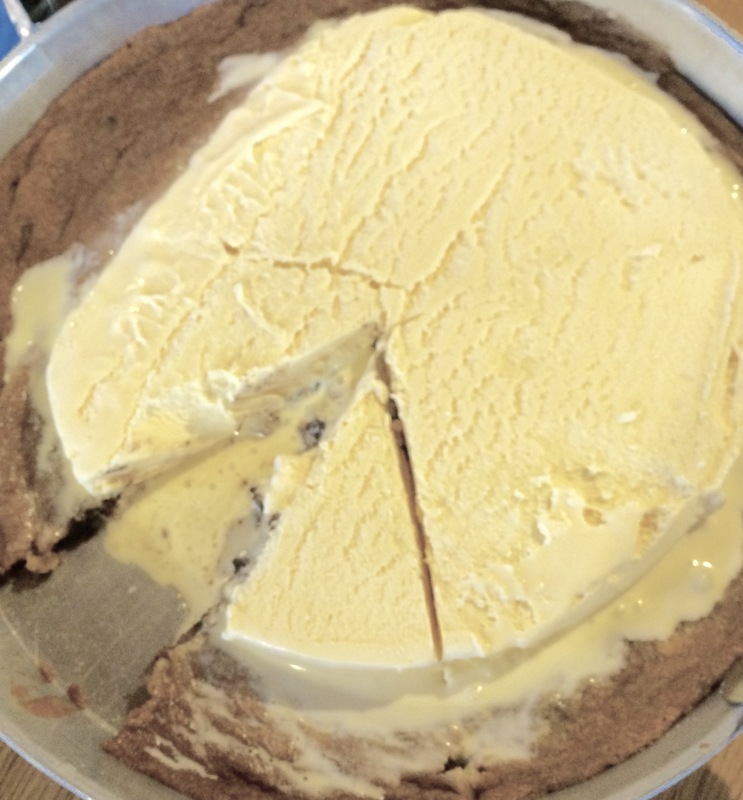 With summer fast approaching, there wasn’t much time to crack the code of The Perfect Dessert. After several months of trying all manner of bakeware, schedules, recipes, and systems, Russell, Dave, and some others – let’s call them Kristina, Mandi, Lindsay, and Brad – finally perfected what has come to be lovingly known as The Big Cookie. Keeping it simple, though, isn’t easy. It rarely is. 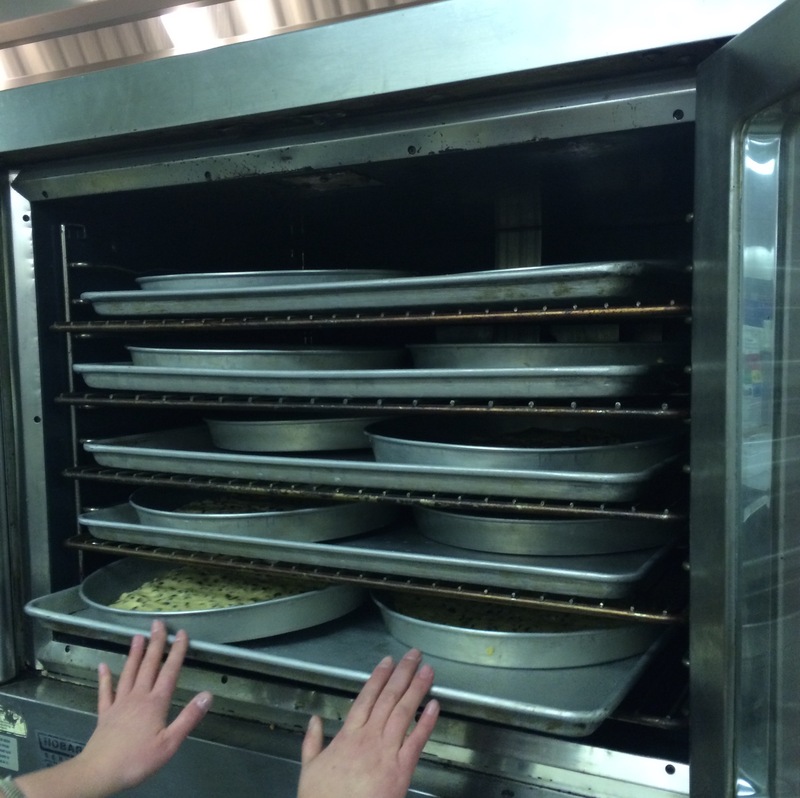 After serving dinner to 400 folks, the Big Cookies – pressed perfectly into their deep-dish pizza pans – go into the oven. Not a moment sooner. 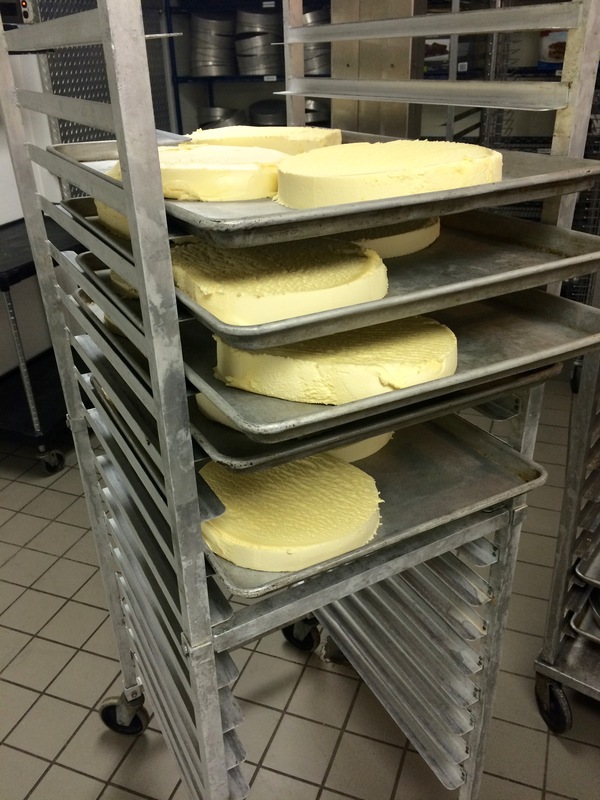 While they bake, thick round slabs of ice cream – cut and kept frozen until just the right moment – are rolled out of the freezer. Just as 400 folks finish eating their dinner, the Big Cookies come out of the oven, cooked so that the outside is perfectly browned and the inside is perfectly gooey. Each one is quickly topped with its own wheel of ice cream that cools the cookie innards just enough to maintain the just-on-the-edge-of-gooey stage while the hot cookie warms the ice cream just enough to make it just-on-the-edge-of-melting creamy. And then they’re served. Immediately. Without a moment to lose. While still hot/frozen. While still perfect. While still sublime. There is no eating etiquette. Fact. Anything goes. Some people like to savor the wonder. Others like to inhale it. The only rule about eating The Big Cookie – and it’s more of a law, really, like gravity, because it’s not legislated on the front end but it proves to be true on the back-end 100% of the time – is that it must be fully consumed. Every last chip. Every last crumb. Every last drip. 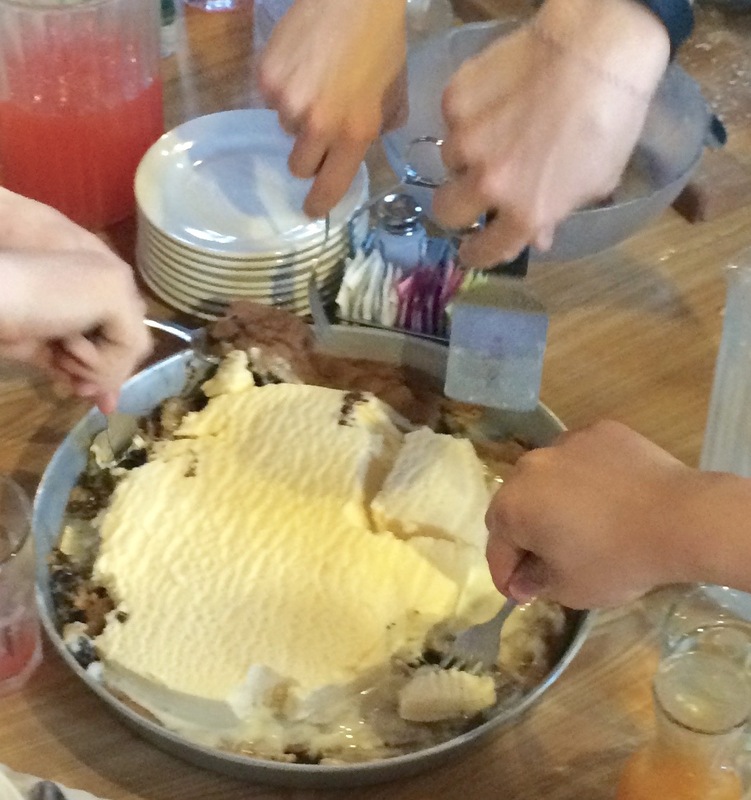 Over the years, The Big Cookie has made its way to almost all of the other Young Life camps (a textbook example of market demand precipitated by word-of-mouth chatter), and each one has its own distinct personality. But the first Big Cookie – The Original, if you will – was first served in a lovely little place in northern Minnesota in the summer of 2002 to 400 people, give or take. That was 13 years ago. The Big Cookie is officially a teenager now, but just as wondrous and delicious as ever. 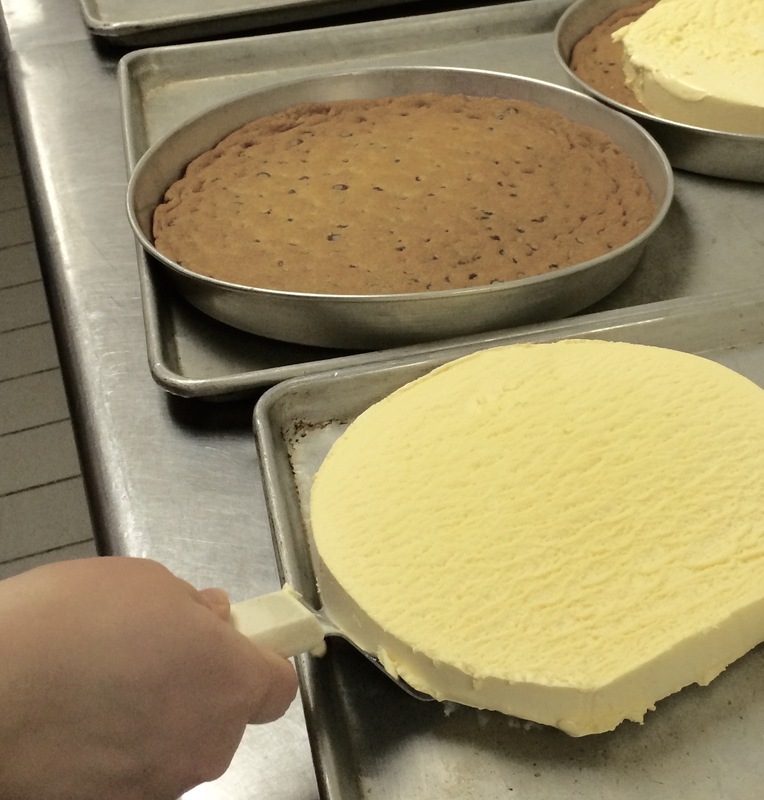 On June 14, 2015, the first Big Cookie of the summer season will be served at Castaway Club, now made by a new generation of kitchen folk – let’s call them Deb and Brandon and company. It’s going to be a stupendous event. Only a very few people will know the story of how it came to be. Most will have no idea how much thinking and hoping and strategizing and trial-and-error went into making it just the perfect combination of hot and cold, cooked and gooey, sweet and sweeter. They for sure won’t realize how much work and planning is required to make such a simple looking dessert so perfectly perfect, week after week after week. **Wowsa. The Big Cookie is near and dear to many people. No surprise there. A few people have asked about the veracity of this story, so I thought I’d give a short background – for those who are interested. From 1992-2004, we lived in Detroit Lakes, MN – just a hop, skip and a jump down the road from Castaway Club. For much of that time, my husband Mark was on property staff while also serving as the Area Director in Detroit Lakes. 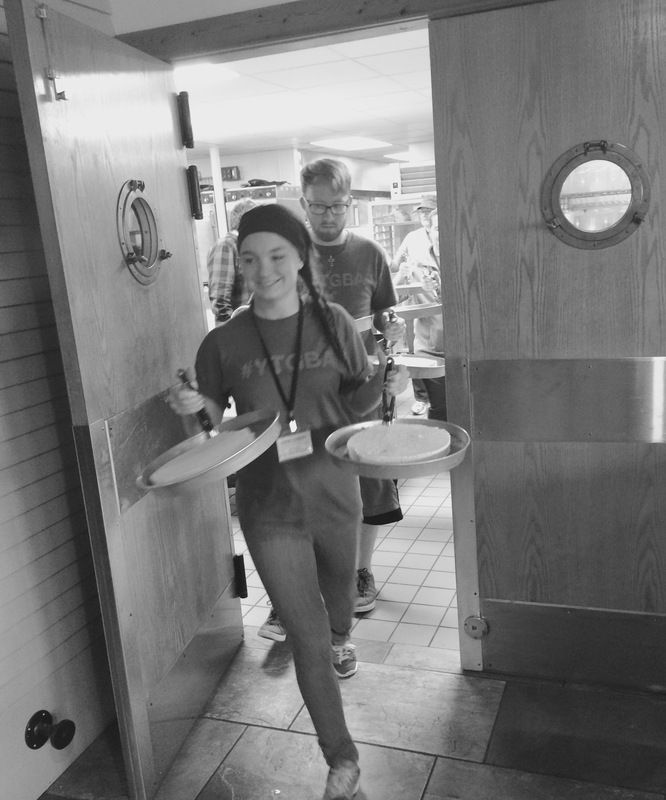 We hosted many weekend camps, did many summer assignments, and knew the kitchen staff (and others) like family. Russell (his real name) just happened to grow up down the street from me. When he moved to MN, he lived with us for a while, and is as close to being family as non-family can be – which is to say he’s family. This past March I was at Castaway Club for a LYO (Lutheran Youth Organization) retreat. They served the Big Cookie. That’s when all of these pictures were taken. All those Big Cookies I’d eaten over the years, and I didn’t have a single photo memory. Weird. Anyway, Dave (his real name) and his daughter Kristina (yep – also real name) were there: she was the camp director and he was serving on kitchen work crew back in his old stomping grounds. One of them mentioned that the very first Big Cookie “experiment” had been at an LYO event a number of years ago. I was curious about just how long ago, so called Russell and had a long talk with him. All of that to say, the veracity of this story is, well, let’s call it veracious. 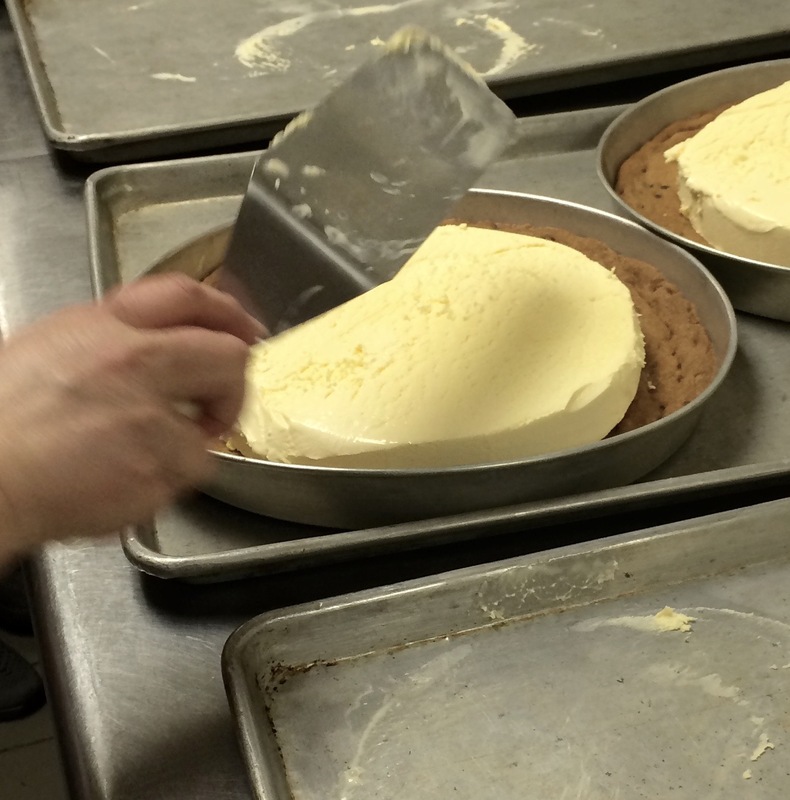 Of course, many more people have been part of The Big Cookie story than those mentioned above. For example, there was a summer kitchen intern that year – let’s call him Jon – who probably constructed more Big Cookies than he can count. And probably every other property staff person has at one time or another been part of the extravaganza known as Big Cookie Night (which is, er, well, the night they serve The Big Cookie). 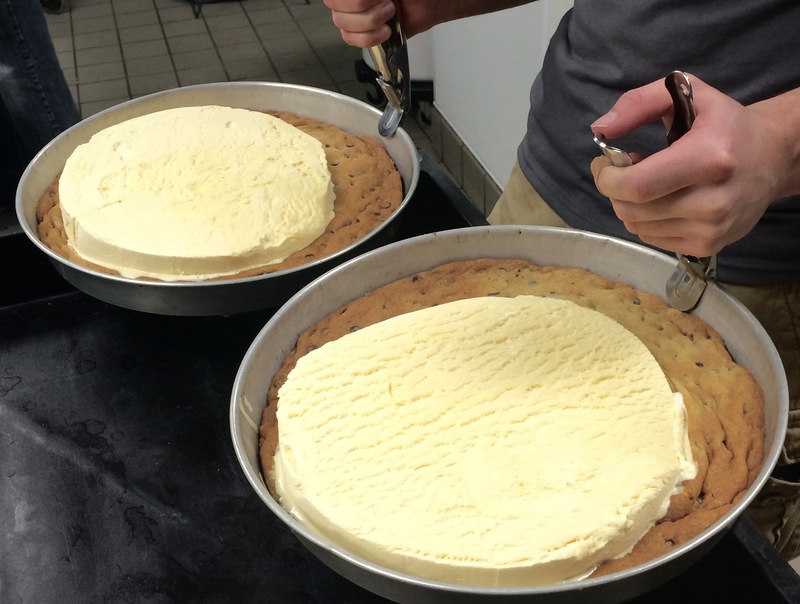 Add in countless kitchen Summer Staff, hundreds of dining hall Work Crew … and everyone who’s ever partaken of The Big Cookie (because let’s be honest, after you’ve eaten it the first time, you are part of The Big Cookie Family forever). 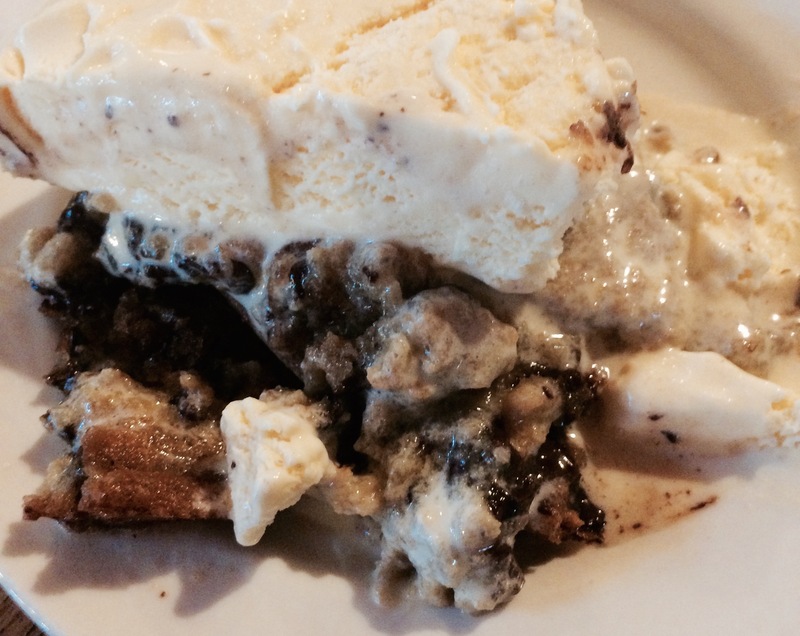 I knew Big Cookie Loyalty and Love ran deep – but even I’ve been surprised by exactly how deep it runs. Really, it’s just one dessert of one night of camp that many people experience only once in their lifetime…but often it’s the small things that become The Big Things, isn’t it? A few days ago, Jesus penned a letter to all the Christians in Indiana and any others elsewhere who might be reading (which I think might have been code for All the Christians America, but that’s just a guess – he kept that a little vague). I didn’t get the letter until today, which makes me wonder what’s wrong with my mail service. It was addressed to me, after all. I also wonder how many other important missives from Jesus I’ve missed. I thought I had them all, but now who knows? If Jesus were here, I’d want ask him something – after first confessing all the ways I continue to fail him, each and every day, in spite of passionately loving him and desiring to follow him closely. I’m basically a schmuck. Layers and layers and layers of selfish, petty, blechness filling up my guts, just waiting for a chance to spill out all over the place. Thankfully, there is also the gracious breath of God nudging aside space to fill up layers and layers and layers of my soul, meaning there is hope each and every day for yet another layer of schmuckiness to get peeled away. At least that’s what I read in an earlier letter. Maybe that’s changed (as this letter seems to imply) and I missed the memo. If I were looking Jesus in the eyes, and he said such searingly difficult things of me, I wouldn’t say nay. He sees things inside I do not. He might have even stronger things to say. But I know he wouldn’t give up on me. At least he never has in the past. I also know that he wouldn’t strip my identity and take delight in sweeping me and everyone else into a dust pan of shame. I know there is much too much yapping, carping, nit-picking, and less-than-neighborly goings-on (not just in Indiana, by all account). I know that a good amount of all the yapping, carping, nit-picking, and less-than-neighborly rhetoric might be so much stinky hot air because many yappers and carpers don’t read the thing they are yapping and carping about – regardless of which angle their yapping and carping may take. But I also know there are countless disciples and followers of Christ who are not primarily angry, combative, petty, and arrogant full-of-themself screamers whose sole accomplishment is to erect unbreachable barriers between the world and God Almighty. I was in the presence of 50 tonight – young adults who joyfully and faithfully give up hours each week to share life with middle school and high school students, listening to their questions, attending their events, celebrating their uniqueness, and breaking down barriers. They are reflecting Jesus to those around them. They are bringing salt and light to a bland and dark world. They are spreading the sweet aroma of Christ wherever they go. They are spilling over with the love of God and changing the world. But their faithfulness is quiet. Their service is gentle. Their voices are soft. They do not scream and thrash about. Instead, they follow Jesus, step by step, day by day, faithfully, humbly, joyfully. Even here in Indiana. They, and countless others, feed the hungry, clothe the poor, comfort the broken, welcome the children, reverently serve and partake of the Eucharist, pass the peace with sincere warmth and concern, humbly refill the coffee pot again, engage in deeply personal conversations with those who are lonely. And so much more. I know such things could and should happen to a greater degree – but still they are happening. Week after week, day after day, minute by minute, by people who aren’t waving placards or shouting platitudes or taking broad swipes but rather people who are intent on following Jesus as best they know how. Admittedly, disciples of Christ make missteps along the way, sometimes serious ones. Our rhetoric sometimes fall short of gracious. Our actions sometimes fall short of kind. Our service sometimes falls short of humble. But Jesus continues working in us, stirring our hearts towards his work, and drawing our souls deeper and further into his. He’s amazingly faithful that way. The views and opinions expressed in this blog are those of the author and do not necessarily reflect any organization or institution she is affiliated with.